Poplar, formerly in the shadow of its Canary Wharf neighbour, is being widely tipped as the next London property hotspot following a planned regeneration of the Chrisp Street Market area. With new research highlighting that homes in regeneration areas attract a premium of almost five percent year on year[i], buyers should look to Bellway’s Lansbury Square development to snap up a new home in a newly sought-after East London location to reap the rewards of the regeneration effect. 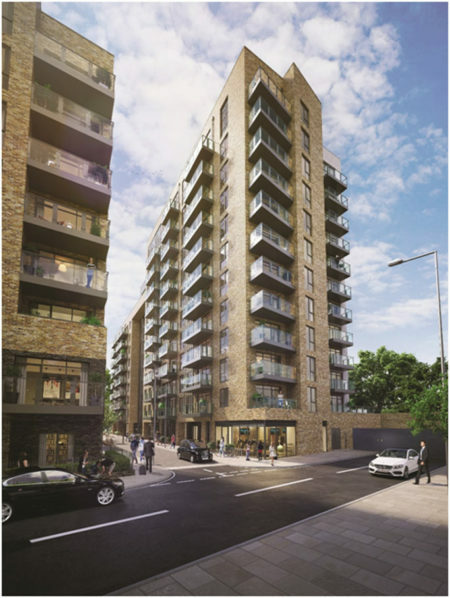 The collection of one, two and three-bedroom apartments by Bellway Homes is situated in the heart of the thriving East London district. The apartments include open-plan living spaces, en suites and private balconies and are available to purchase with Help to Buy. The development also features an onsite gym and concierge service. Emma Hamlett, Sales Director at Bellway Homes, comments: “Lansbury Square offers buyers the chance to invest in an affordable new home, before the full regeneration of the area takes effect. “Poplar is already a great choice for first-time buyers and professionals, with a superb location, offering great transport links around the capital. Ideal for shopping, Lansbury Square, is only a five-minute train journey from Canary Wharf with Jubilee Place, Crossrail Place, Cabot Place and Canada Place all offering a selection of designer and high-street brands. Westfield Stratford City is also ten minutes away by car, offering over 250 stores, cafés, bars and restaurants, as well as a 17-screen cinema. For active residents, Poplar Baths Leisure Centre offers a fitness studio, swimming pool, sports hall and rooftop football pitch just half a mile from the development. Mile End Park Stadium also includes facilities such as tennis courts, an athletics track and hockey, football and netball pitches approximately a mile away. Further afield, the Queen Elizabeth Olympic Park, which encompasses the Olympic Stadium, the London Aquatics Centre and the Lee Valley VeloPark, is a short eight-minute drive from Lansbury Square. The buzzing atmosphere of the O2 is only a ten-minute drive away, or for world-class drama, musicals, comedy and dance, the theatres of London’s West End are accessible both by car, the London Underground, or DLR services. Ideal for commuters, Langdon Park DLR station is just a three-minute walk from Lansbury Square. The closest London Underground station is Bromley-By-Bow (District, and Hammersmith & City lines), and is only a 15-minute walk from home. For travelling by car, major roads are easily accessible, with the A12, the East India Dock Road and the A11 all close by. Prices at Lansbury Square start from £392,995 for one-bedroom apartments, £485,995 for two-bedroom apartments and £594,995 for three-bedroom apartments, available with Help to Buy. For further information please visit www.bellway.co.uk or call 0203 092 8982.